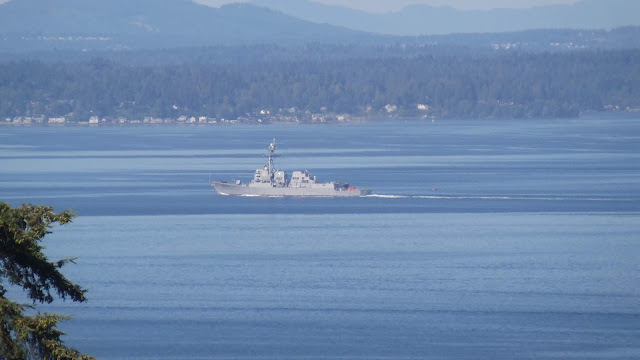 Quietly sailing through the Shoreline Sea this morning was an Arleigh Burke-class destroyer, DDG 102, USS Sampson. She was commissioned in 2007, and is the fourth U.S. Navy ship named to honor Rear Admiral William T. Sampson. This is a guided-missile destroyer and carries two Sea Hawk helicopters. NavSource states that she is armed with an Evolved Sea Sparrow Missile, 96 VLS Cells, and 8 Harpoon Missiles. The ship’s motto “Through Courage and Arms” can be delivered swiftly at over 30 knots/hr. Sampson returned to the Naval Station Everett in early May after completing a seven-month deployment. She joined the Theodore Roosevelt Carrier Strike Group on Oct. 3, 2017. The destroyer provided seaborne protection to the strike group, escorted high-vale ships, and served nearby communities during port calls in the U.S. 5th and 7th Fleet areas of operation. While deployed, Sampson participated in exercises with the Egyptian and Republic of Singapore’s Navies at the Doha International Maritime Defense Exhibition and Conference. She strengthen partnerships with the participation nations during combined exercises. Sailors also served as volunteers in communities during port calls in Bahrain, Saipan, Philippines and Singapore by visiting local schools and social welfare centers. Her deployment is an example of our Navy’s routine presence in waters around the world, displaying commitment to stability, regional cooperation, and economic prosperity for all nations. On May 10th Vigor Marin LLC was awarded a $42.2 million contract to prepare for and accomplish repair and alteration requirements for the USS Sampson’s Drydocking Selected Restricted Availability (SRA). Work is expected to be completed by April 2019. In June she was moored at the Ammunition Pier, Naval Magazine Indian Island in Port Hadlock, Wash for a three-day ammo off load. Maybe we will see her again sailing north next April.